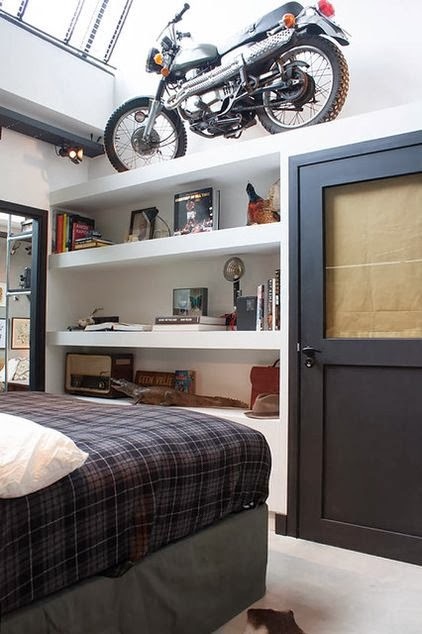 I came across what I'm calling the "ultimate bachelor pad" on Houzz the other day and just had to share the uber cool place with you. 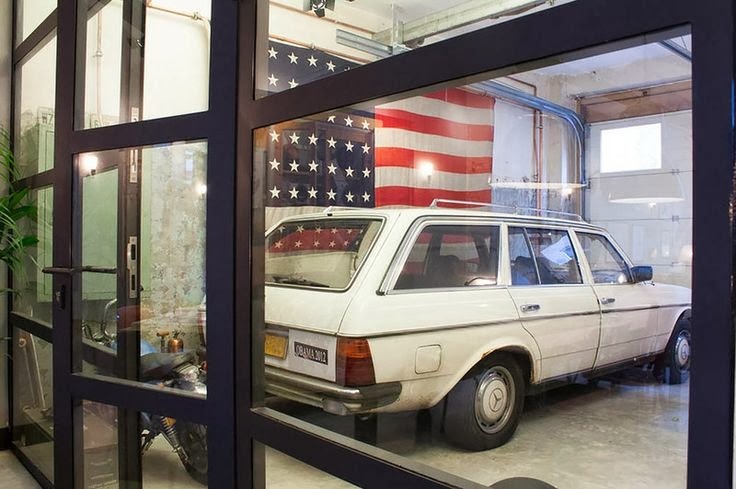 It's the perfect combination of industrial, vintage, and modern design in a converted old auto repair shop in Amsterdam. The designer (and homeowner), James van der Velden, had an awesome vision to put this place together. Now, check it out! The atrium is the main source of natural light in the home. 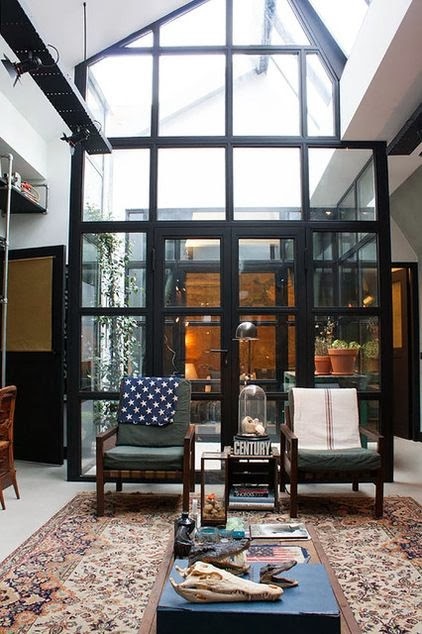 It provides such a great focal point in the middle of the space, and who wouldn't love the black casement windows? Here's the outer (but still enclosed) area of the atrium, where the homeowner grows his kitchen herbs. Next up, we have the living space. 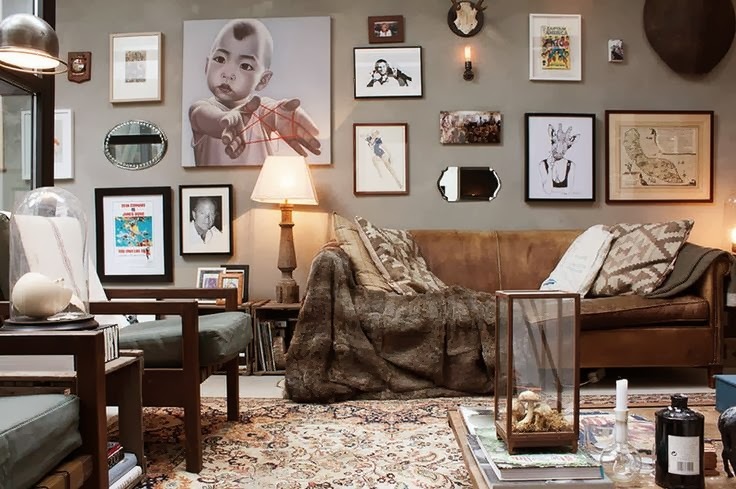 The room screams crazy eclectic well-traveled cool. 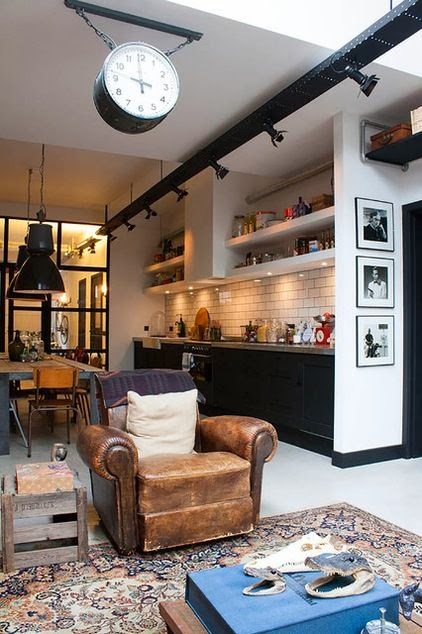 Check out the railway station clock that hangs from the ceiling and that well-worn vintage leather chair? I'll take one of each, please! 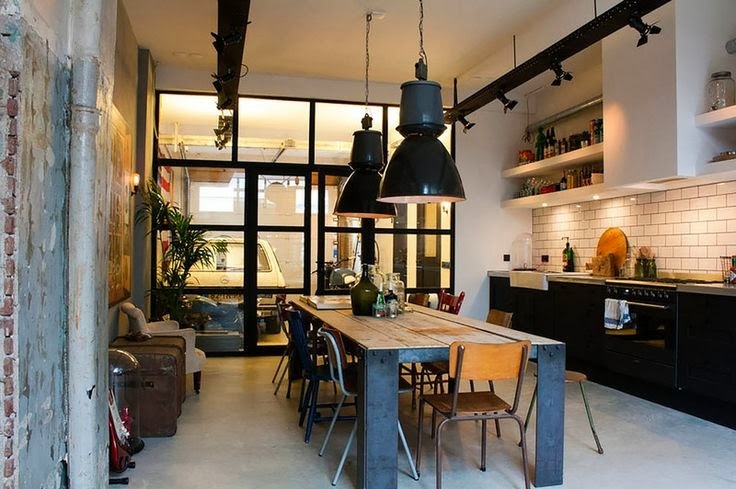 On to the kitchen space, which is dominated by the most awesome industrial pendant lights I've ever seen, and a pretty hip wood and metal table crafted by the homeowner. 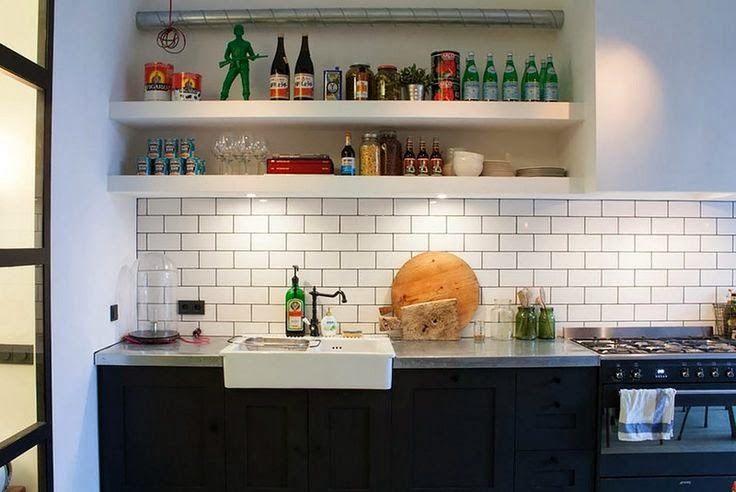 Did you happen to spot the garage straight past the kitchen? It's exposed in all it's glory to the rest of the house...separated from the kitchen by yet another set of the coolest casement windows ever. Now that we're beyond excited and can almost smell the exhaust from the garage (why that's cool, I'm not sure...but it is), on to the bedrooms and bath. 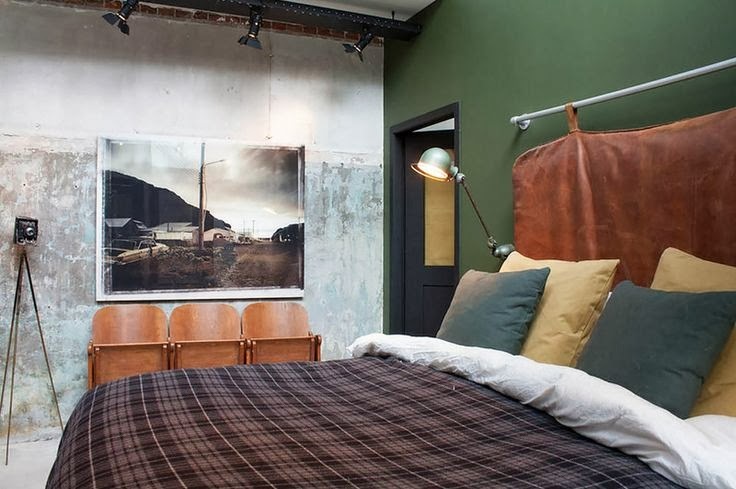 First the master with it's leather and metal pipe headboard. Doesn't that just sound manly? Even though this place oozes man musk, I'm totally diggin' it as a space for a family too. I think because it's put together so well. The black doors with the pull-down shades...nicely done, my friend. 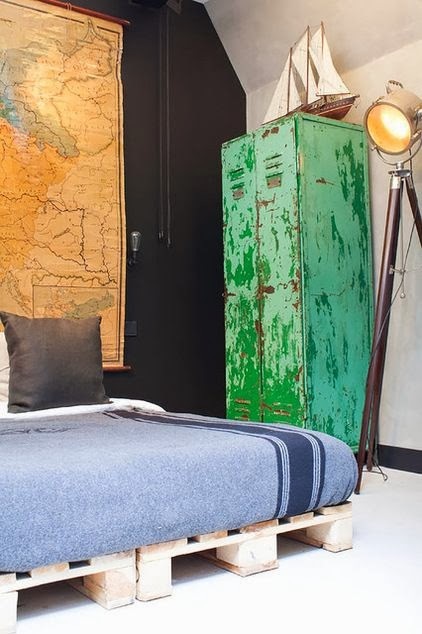 Now for the guest room and it's rustic pallet bed and lockers with the perfect green patina. 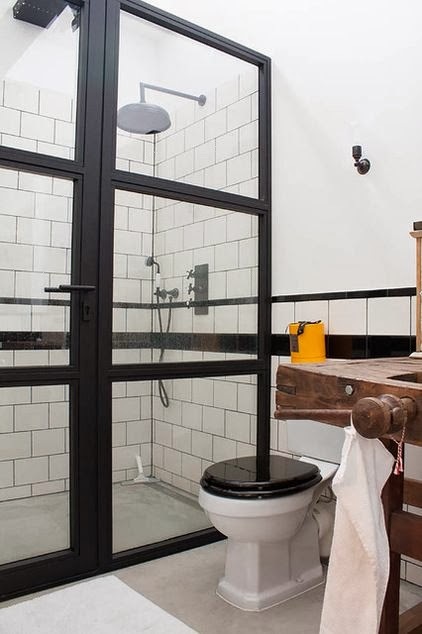 And, finally, this bath's shower door perfectly pulls together the theme of the black casement windows in the atrium and the garage. 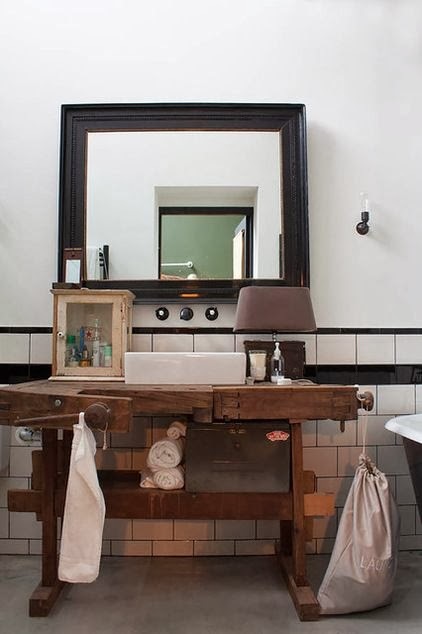 How about that vanity? 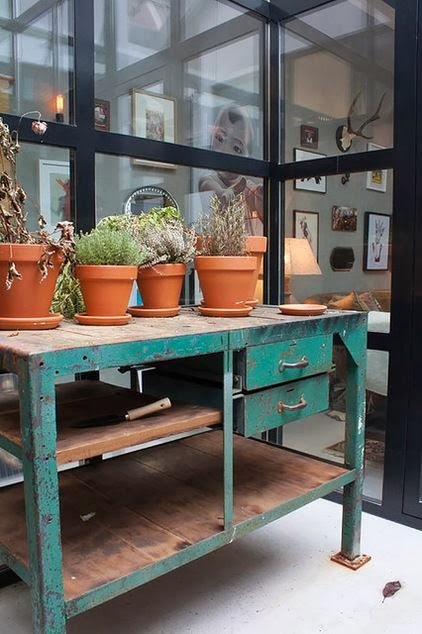 It was crafted from an old workshop bench, of course. What do you think of the space? Is it just me, or is it kind of nice to see a house without a single gold or brass accent? The mixed metals are still there, but in bronze and zinc and iron - perhaps we'll see a little more of that in design this year (and a little less of the gold, perhaps? ).